Three years ago I wrote a post alarmed that measles was on the rise in the U.S. Little did I know then that this was only going to get worse. There were 222 cases of measles in the U.S. in 2011, the highest number since 1996, and much higher than the average annual case count in the last decade, 60. This may not sound like a big deal, since most cases of measles are mild, but a third of the patients with measles are hospitalized. Fortunately, there were no deaths in the last year. Because the U.S. population vaccination rate for measles is very high, most of these cases (200 of the 222) were linked to importations of measles from abroad, either due to a US traveler being infected while outside the country, or a foreigner traveling to the US while contagious. Half the cases from abroad were from Europe, primarily France, Italy and Spain. (This proves that despite their fiscal challenges the European Union can still export something.) Unlike the US, Europe has never eradicated year-round person-to-person transmission of measles, so it continues to act as a reservoir of disease. 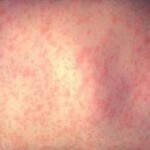 In fact, last year, over 37,000 cases of measles were reported in Europe. So the CDC is stressing two points. The first is that the MMR (measles, mumps, rubella) vaccine is effective and safe, and all children should have two doses of it. Some of the measles cases last year were among patients who could have received the vaccine but claimed exemptions due to philosophical or personal beliefs. Unvaccinated people don't only run the risk of being infected with measles themselves; they also risk infecting those around them, particularly infants too young to have been vaccinated. The second message promoted by the CDC is that travelers abroad should make sure they're immune to measles. Those born before 1957 are presumed to be immune because that was before the vaccine was widely used and everyone was exposed. Everyone born since 1957, however, should be sure they've had two doses of MMR. For those who are not sure, the CDC simply recommends revaccinating. An additional MMR is safe even if unnecessary and is more reliable than checking a blood test to determine immunity. So when you go to the London Olympics this summer, keep in mind that the adorable Parisian child in the next seat might be a biohazard. Defend yourself.